It cries out to be used in stereo, in a two-amp rig, but is a very versatile, pro-grade unit, even in 'vanilla' mono chorus roles. Great build quality and sounds; stereo sounds are something special; presets allow on-the-fly voice changes. Not especially cheap and likely over-spec'd for players who only use chorus now and then; oversized footprint. Blue is the internationally recognised colour of chorus, of course - it's in the Geneva Convention - but in other ways, playing the Tri-Avatar defies expectations. While the Tri-Avatar is not a copycat design, the lushness of 80s tri-phase, rackmount chorus effects is a touchstone here. The unit splits your signal into three pitch-modulated paths (plus one dry path), each of which is 120 degrees out of phase with the next - generating the complex phasing effects that give this chorus a rich, mirage-like shimmer, even in mono operation. The relative blend of those modulated signals is governed by three depth knobs, while the Dry Mix control enables you to blend back in up to 50 per cent of your dry signal for subtler chorus sounds. As expected, the Rate control determines the speed of the modulation here, from slow sweeps to seasick wobbles, while High Cut smooths off top-end detail. Both features can be controlled by an expression pedal (not supplied). The Mode switch lets you engage four different preset voices, which you can cycle between with a dedicated control - useful for switching from a rapid, Leslie-style flutter to a cool, complex ambience in the course of a song. You can overwrite factory presets easily with the press-and-hold Edit function, active when Preset mode is selected. At the back, stereo outputs open up multi-amp rig possibilities. When A/B'd with Providence's Anadime, although the circuitry is wholly different, the warm mono voicing with everything at 'noon' settings is similar. Exploration with the depth controls reveals everything from watery shimmers, with the depth controls panned hard left, right and centre, to deep, churning squirms with all depth dials on full. Bringing the Dry Mix knob into play adjusts the transparency of those voices as desired. 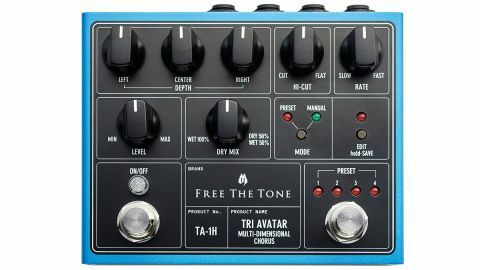 Plugging the Tri-Avatar into a two-amp rig reveals its most stunning sounds, however: with a touch of delay added, its stereo chorus voice is so spacially enormous, it's almost narcotically floaty and lush. A must-try. If you only use chorus occasionally, the Tri-Avatar is likely over-spec'd for you. But there is a lot of light and shade here for the rest of us to enjoy.